You have four wisdom teeth (molars), one in each corner of your mouth. These teeth are the last to grow in –usually when you are between the ages of 17 and 25. 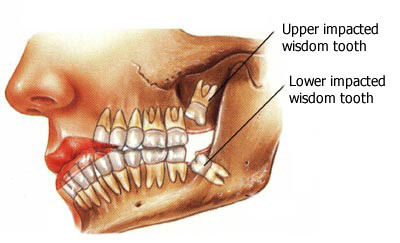 This is the time of life called the Age of Wisdom, hence the name wisdom teeth. When there’s not enough room in the mouth for a wisdom tooth to break through,it will push or get stuck against another tooth and grow at an angle under the gum. 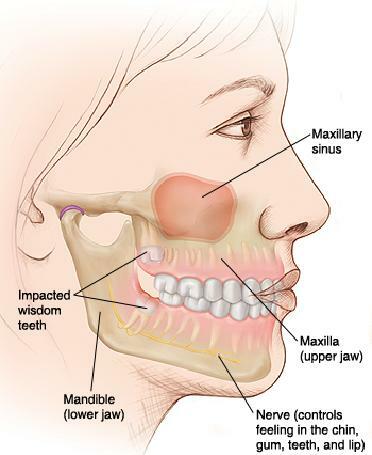 This is called an impacted wisdom tooth, and will cause pain and irritation. If part of an impacted wisdom tooth pushes through the gum,the gum may become sore and swollen. Food particles and bacteria can collect around the impacted wisdom tooth and cause decay. It’s very difficult to remove that decay and it will most likely cause an infection.In most cases, an impacted wisdom tooth has to be extracted.